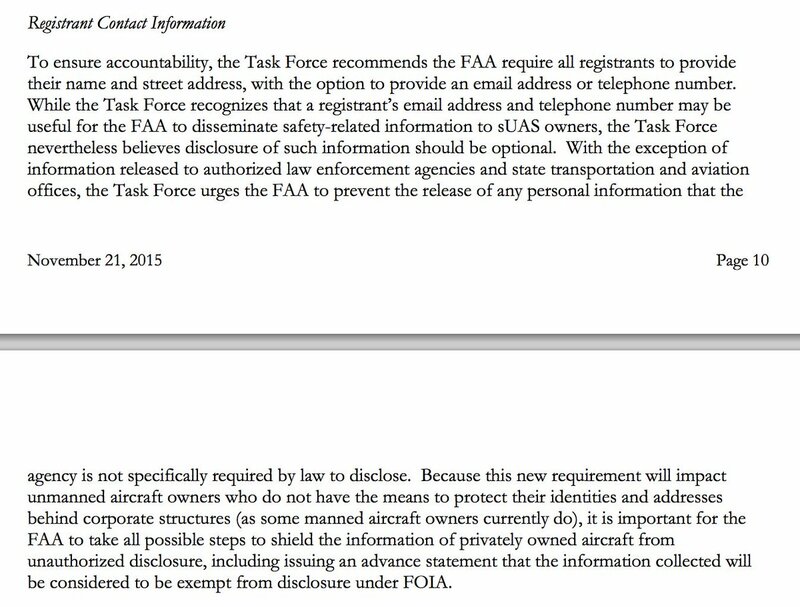 The FAA’s drone registry shouldn’t be exempt from FOIA requests. An operator controls a drone using a remote transmitter for recreational purposes in the sky above Syosset, New York, on Aug. 30, 2015. When its proposed national drone registry comes online, the Federal Aviation Administration will be poised to collect the names and street addresses of recreational drone users across the country. Who will be able to access that data after it is collected? If the FAA’s drone task force has its way, the answer will be not journalists. As a journalist, I blanch whenever I see the phrase exempt from disclosure under FOIA. Maybe I’m old-fashioned, but I think that nonclassified public records ought to be made accessible to the public. Government agencies are allowed to withhold data from FOIA requestors if, among other reasons, the data being requested contains “information that, if disclosed, would invade another individual’s personal privacy.” And, yes, the FAA could make a case that disclosing the names and addresses of drone registrants would constitute a violation of individual privacy. But the idea of a blanket exemption is nevertheless troublesome. The FOIA.gov website states that “even if an exemption applies, agencies may use their discretion to release information when there is no foreseeable harm in doing so and disclosure is not otherwise prohibited by law.” The task force is basically recommending that the FAA should never use its discretion and should always presume foreseeable harm. This emphasis on guarding registrants’ data against legitimate FOIA requests seems especially curious because overall the panel had very little to say about securing data. Though the FAA had asked the task force to consider how the registration data should be stored, accessed, and used, these questions went unanswered. The final report said nothing about how—or even if—the registry data would be kept secure, let alone how to shield it from hackers or others who might prefer to access it through illegal means. In the report, the task force noted that “the timeframe provided for deliberations did not allow for in-depth analysis of all the factors involved in instituting a federal requirement for registering [drones],” and I can only presume that this compressed timeframe is also responsible for some of these omissions. But it’s also worth noting that the panel was comprised almost entirely of trade organization representatives and industry personnel; as I noted in October, no dedicated civil-liberties advocates were appointed to serve. This imbalance was a mistake, and I can only hope that the agency rectifies it by taking civil libertarians’ concerns into consideration before implementing the registry. Far from instilling trust in the FAA’s ability to protect registrants’ personal information, a preemptive strike against FOIA will just end up making people wonder what the FAA has to hide.